Sometimes, we make apple pie without a crust or a pie tin. Oh, and we don't bother to bake it either. This is my definition of Autumn Apples: "Pie filling that we named so we can eat it." Really. This is my mom's apple pie filling recipe. So, basically, it's just apples with spices? Yep. Hey now, be fair. You haven't even given them a try. These apples grew up thinking they could only be a pie filling, but they have a different dream. A new dream. I'm sorry to be the one to tell you this, but baking them into a pie has been your dream, not theirs. Peel, core, and evenly slice the apples until you have 7 cups. If you have teeny apples, you might need 7, but it you have monster apples you might only need 6. It took me 7 apples to get 7 cups. 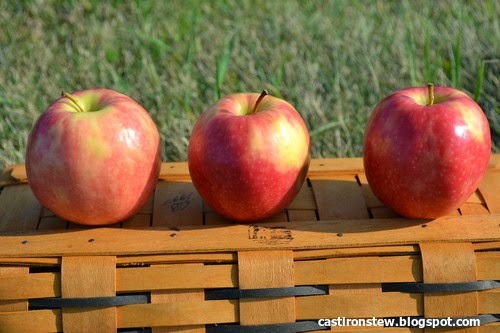 If you need to, transfer the apples from the measuring bowl to a larger bowl for more room. You should have plenty of extra room so that the next step is easier. 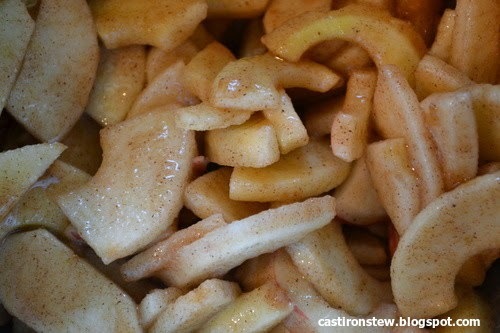 Add the flour, sugar, cinnamon, nutmeg and salt to the apples. Stir them until each piece is evenly coated. Let the apples rest for awhile, they deserve it. The longer they sit, the more juices they will produce. You could put the apples on ice cream, warm it up and use it as a side dish, eat it, or ruin the whole point of naming them "Autumn Apples" and stick them in a pie. "You don't have to live up to the standards of today's kitchen. Be yourself and surprise the world with just how delicious you can be." -Autumn Apples to young, aspiring apples.